The Library is the heart of the institution. It is to promote sharing of resources by collecting, storing and disseminating information and by offering computerized services to the users. The College Library was established in the year1969. Thiru. E. Rengasamy Konar, One of the founders and former Correspondent of Yadava College donated all the books of, “Erulappa konar Memorial Library” founded by him at North Masi Street, Madurai. The college library was initially started with these volumes. Late Thiru.Chellaperumal, Late Thiru. R. Arangannal, Thiru. D. Nagendiran, Mullikulam late.Thiru. S. Sundara rajan, Dr.K. Ramanujam, Mr. K. Arunagiri, Prof. K. Baskaran, the Joint Director of collegiate Education and Dr. N. Ramalingam had presented hundreds of rarely available books to the college library. Our college library is functioning in a separate building and possesses all modern facilities, which fulfills the need of the students in the latest developments in different areas of study. 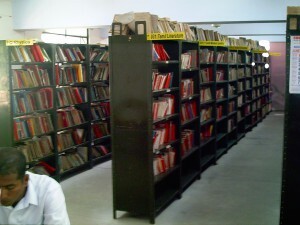 The library is also equipped with Internet browsing centre, Intranet facility, talking book library for visually challenged students, audio-visual center, reprography facility, digital library with educational CDs, e-Books, e-Journals, separate reading room for the research scholars and the teachers, reference section, back volumes section, career corner, online public access catalogue and UGC-Inflibnet e-resources. All students of Yadava College are members of this library. Our Library getting access to e-resources through programme entitled “National Library and Information Services infrastructure for Scholarly Content (N-LIST)” funded by the Ministry of Human Resource Development under its National Mission on Education through ICT. The N-LIST project provides access to e-resources to students, researchers and faculty from colleges and other beneficiary institutions through server(s) installed at the INFLIBNET Centre. This programme would provide access to more than 2,100 e-journals (including current issues with 5-10 years back files) and more than 51,000 e-books. The resources would be accessible from http://nlist.inflibnet.ac.in. Following is the list of E-Resources. E-Journals (Full Text): American Institute of Physics (18 titles), American Physical Society (10 titles), Annual Reviews (33 titles), Cambridge University Press (224 titles), Econamic and Political Weekly (EPW) (1 titles), Indian Journals (150 titles), Institute of Physics (46 titles), Oxford University Press (206 titles), Royal Society of Chemistry (29 titles), H. W. Wilson (1420 titles), E-Books: E-brary (45000+ titles), Oxford Scholarship (902 titles), Net Library (936 titles), Myilibrary-McGraw Hill (1308 titles), Bibliographic Database: MathSciNet, E-Resources for Universities: Web of Science, E-Resources for Technical Institutions (IITs, IISc, IISERs and NITs): Annual Reviews, Project Muse, Nature. Membership is open to all the staff and students of the college. The working hours of the library on all working days and examination time are 8.30a.m. to 7.30 p.m. and on holidays it is open between 10.00a.m. and 2.00p.m. All members of the library shall enter their names and sign legibly in the register which is kept in the entrance of the library. While entering the library, readers should leave their personal belongings, such as bags, brief-cases, personal books, and parcels near the counter reserved for this purpose. However, they can carry loose papers and note books. All members must bring their identity cards issued by the college while using the library and a member must use his/her identity cards only. Readers should maintain silence in the library and should not disturb other users in anyway. Using of mobile phones inside the library is prohibited. Books or others materials taken from the stacks should not be re-shelved by the readers but should be left on the tables reserved for this purpose. Readers should not deface, mark, cut, and mutilate library materials in anyway. If anyone is found doing so, he/she will be charged the full replacement cost of the material. If any of the books borrowed from the library is lost or damaged the students have to either return a new copy of the book or have to pay the current price of the book or have to pay the amount prescribed by the librarian. Library’s Internet Browsing and photocopying services are fee based. If the borrowed books are not returned to the library, the college will not issue Transfer Certificate and Conduct Certificate of the student. Not withstanding anything contained in these rules, the decision of the authorities of the college in all matters shall be final. Library services are fully computerized. Books are issued to the students and staff with bar coding system. OPAC system available for book availability and other searching purposes. Reference books, Encyclopedias, Hand Books, Dictionaries, Periodicals, Student Projects and back volumes will not be issued and they are only for reference. One renewal will be permitted if there are no reservations against these books. For renewal, books have to be presented physically at the library counter. Members, before leaving the counter must satisfy them as to whether the books, which they intend to borrow, are in good condition and any damage/marking should be immediately reported to the librarian failing which the member to whom the book was issued will be held responsible. Fifteen Books are issued to faculty members for a period of 90 days. Five Books are issued to Administrative Staff for a period of 14 Days. The issue of library materials ends at 1.00 p.m on holidays and 5.30p.m. on all other days. When a member leaves the college he/she shall return all the books. Books must be returned on or before the due date noted in the due date slip. If the day happens to be a holiday, the book must be returned on the next working day. If any student keeps any book beyond the due date of return, otherwise overdue charges will be collected as per the existing rules. Loss of books, if any, should be reported to the librarian immediately and it should be replaced with a new copy along with a levy of overdue charges if any. In case the borrower is unable to replace the books that are lost, he/she will be levied a penalty as per the existing rules overdue charges, if any.